The Steeds: Some Halloween Fun! I love my family Halloween party! It is fabulous. Every year my whole family dresses up and we have a great party. It is so fun to see everyone in their costumes! 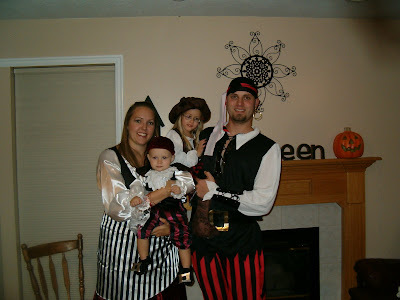 Usually I dress up as the same thing every year but this year we mixed it up and are a pirate family. The kids costumes are so cute! I love it. Good food and good company, my favorite kind of parties! No one's showing any love to the trannies...I guess we showed up too late for pictures. You guys looked awesome in your pirate gear. I dont have any pictures of your costume's! I LOVED them though. You guys never let me down! That looks like so much FUN! I wish my family did cool things like that. 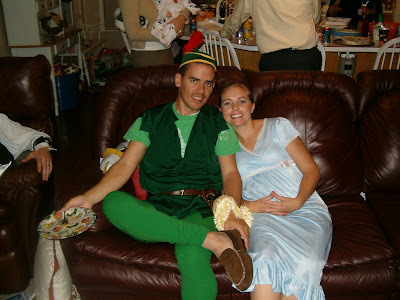 My husband and I are actually going to dress up this year for a change..it's a start right? The pirate family is too cute! Did you make those costumes? Being a big "Office" fan, I got a big kick out of Dwight and Angela. You obviously have very creative family!